I want to start off by saying, I know. 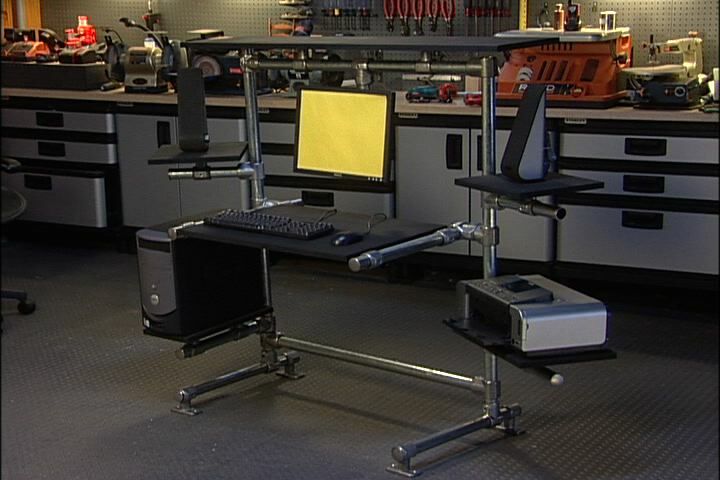 This is an overkill streaming desk and I love it. Go big or go home and save your pennies so you can eventually go big. That's the motto I live by when it comes to technology and tech setups. About 6 months ago I decided I wanted to start streaming on Twitch. 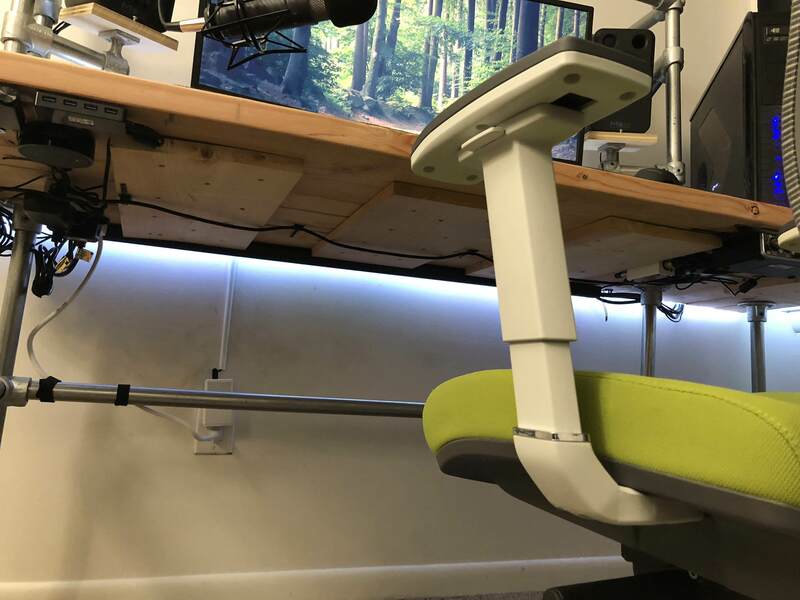 So I wanted to create an epic desk that would give me the flexibility to adjust things as my setup and skills improved and keep everything off my desk so I could focus on the stream and not the junk sitting on my desk. 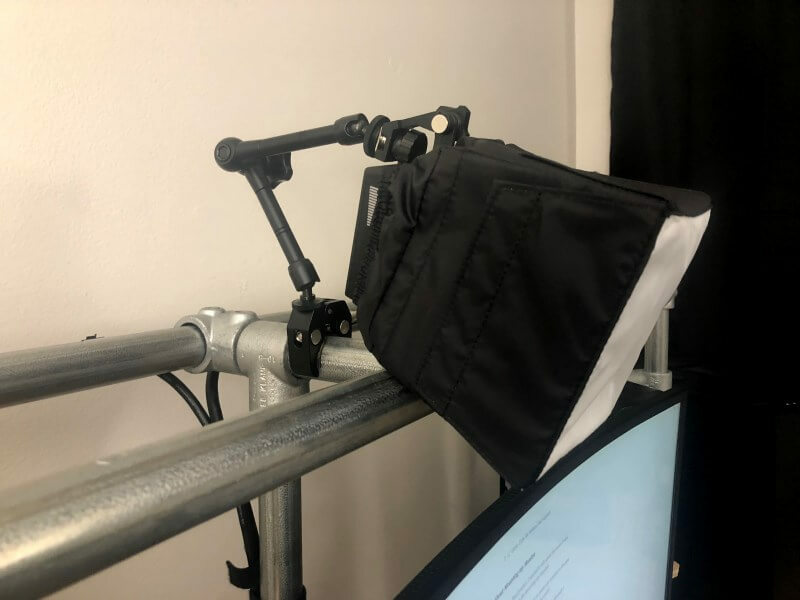 To be able to mount accessories to the frame like lighting, mics, and reflectors. These features directly influenced the height of my truss and my overall frame. I'd recommend figuring out what features are most important to you and then use those as a "box" for your design ideas. 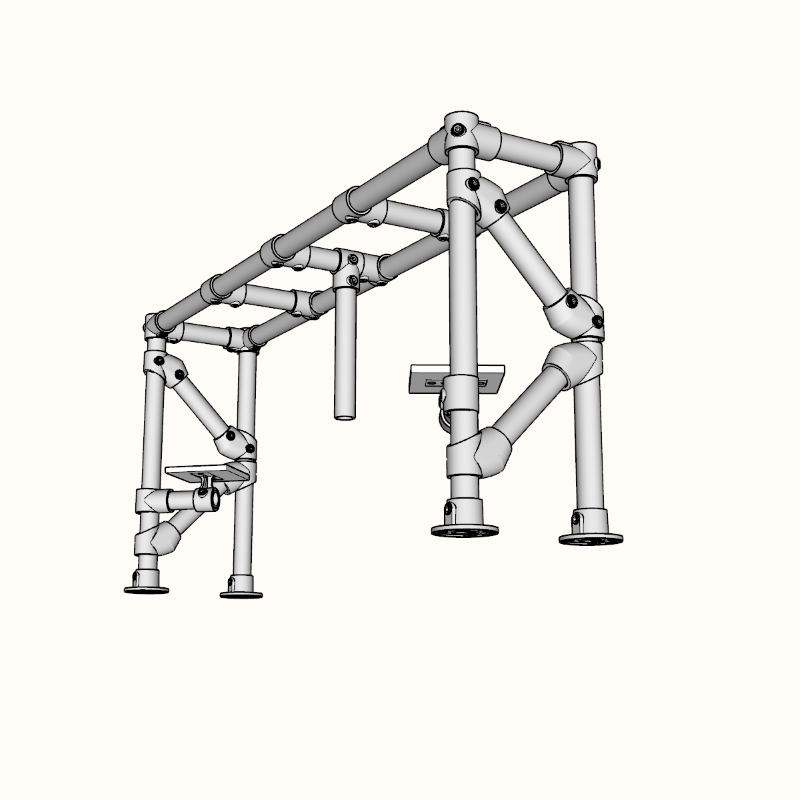 I started with a basic idea of creating a frame that looked like stage truss, the metal frames used in live productions and trade show booths. 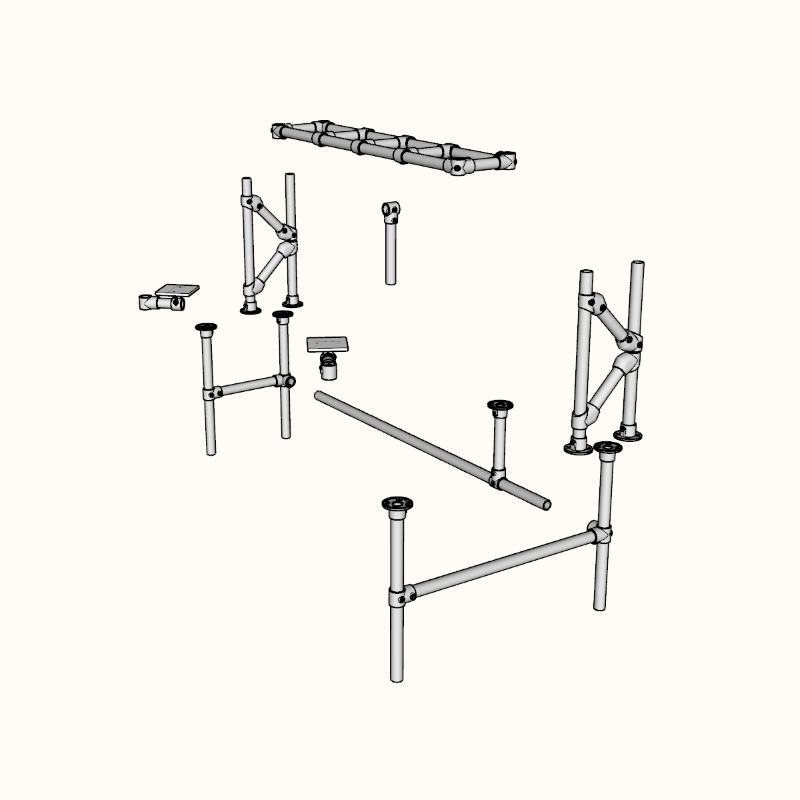 Taking into account all of the benefits of a truss system like easy mounting points for gear, strength, rigidity, etc. 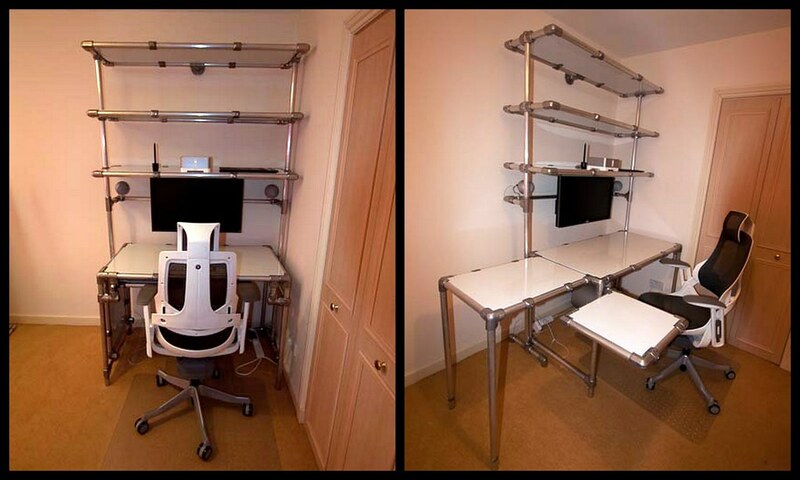 Then I took some inspiration from Simplified Building's vast library of DIY desk designs. The particular designs that I took some inspiration from are featured below. I opted to use Kee Klamps from Simplified Building to make my faux-truss. 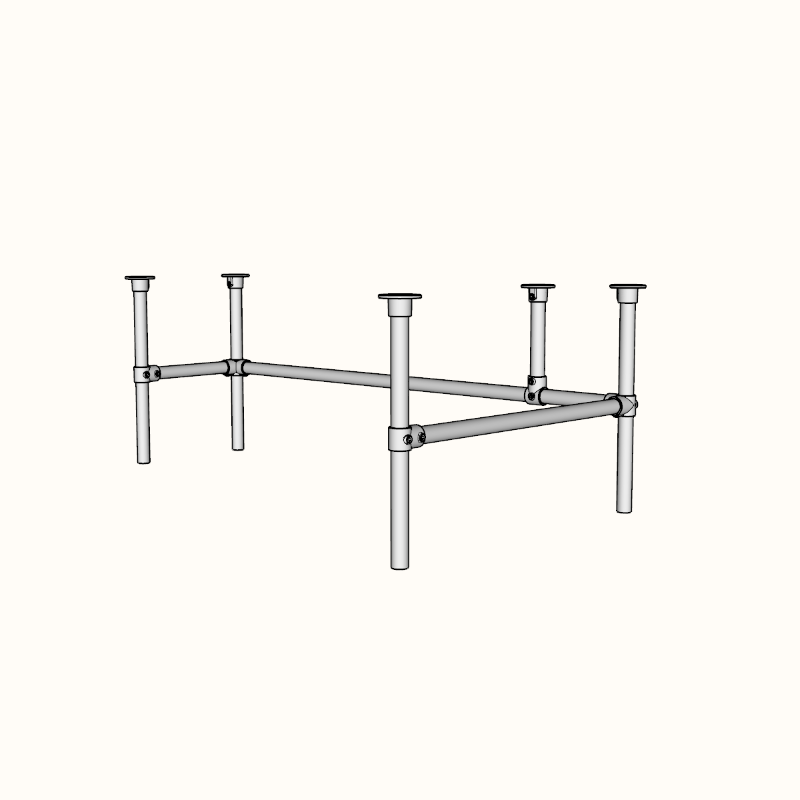 Kee Klamps combined with gator tubing or schedule 40 pipe creates a very flexible system that is easy to build, modify, and transport. I'm actually moving in several weeks and am very thankful I chose to use materials that are very easy to partially disassemble and transport. Moving a desk this large all at once would be a huge PITA. My Corolla only has so much trunk space. See below for a complete parts list. For the desktop, I went with basic 2 x 10's from Home Depot and had the friendly staff there cut it down to size for me, this made transportation very easy and saved me a bit of time during final assembly. I decided to forego stain, sealing, or anything like that for the desktop. I don't plan on this desktop lasting me a lifetime and will probably replace it with something much nicer in the future. Like I mentioned before, if you don't go big save your pennies and go big later. Being a DIYer and a tinkerer, I'm somewhat familiar with the program SketchUp and decided to use that to pull together my initial design ideas. 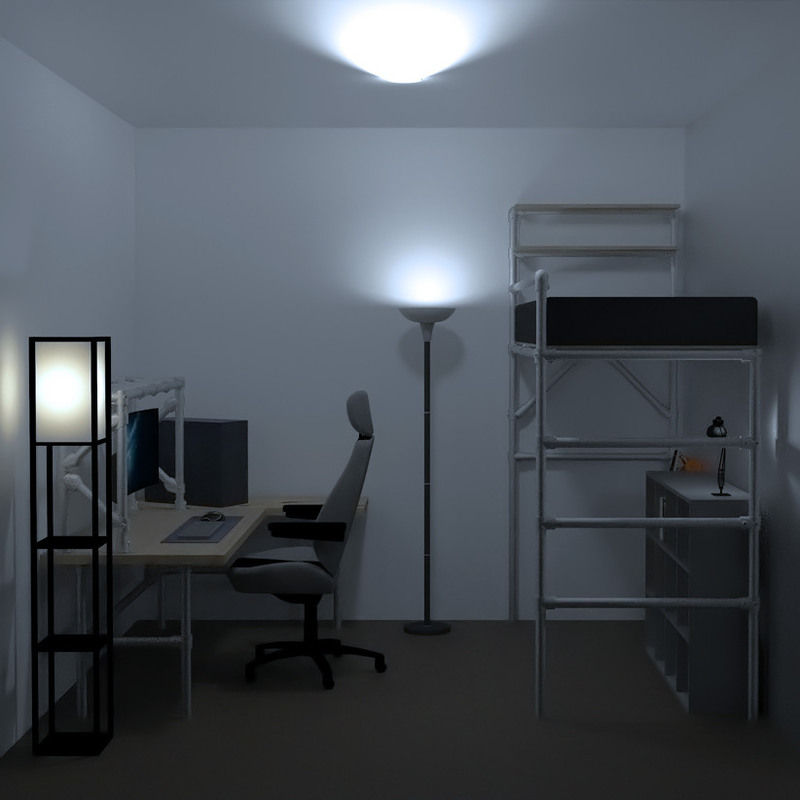 Sketchup is great if you want to build a 3D representation of your idea. Personally, I like to see something in a bit more detail before I drop hundreds of dollars on it. After quite a bit of iteration, self-doubt, and failure I came up with the following design. I know, I know. But c'mon, it's cool! The hobby version of Twilight Render is also free, so have it folks! Here is a bit of an exploded view to see more of the individual components. In addition to gaming on my PC, I do a bit of hardware tinkering and PC building, so I chose to add a leaf to my desk to add more usable work space. I wanted to get my computer up off the floor, so the leaf also adds more room to fix the computer at an angle and give me easy access to the top I/O and power switch. The base of the frame is very basic and functional. I don't look under my desk often, so I put my effort and money into the top truss frame. However, I did position my middle support along the back of the lower frame at optimal foot rest level. I like to kick back and watch movies at my desk, so this adds a bit of comfort. I may add some foam padding or something later to increase the comfort of this. The pipe tends to get a bit cold in the winter months. 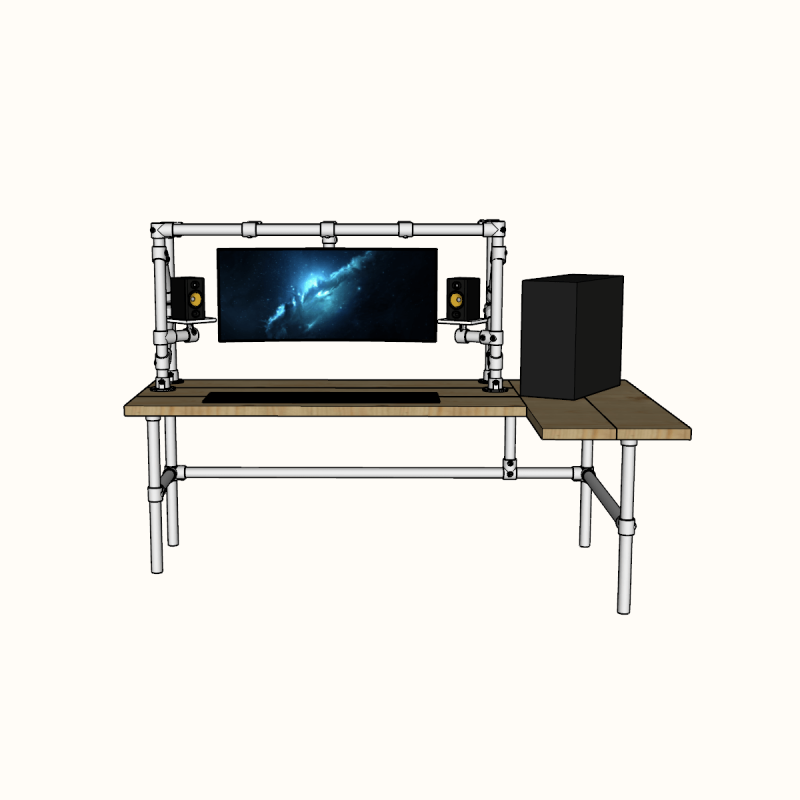 Like I mentioned before, the height of the truss frame is directly influenced by my need to have my monitor and speakers at optimal levels. So I chose 26" as my height after doing a bit of testing and measuring. After "finalizing" my design (nothing is ever final in my world), I went about creating a parts list. If you're looking for an alternative to Kee Klamp check out Easyfit, they have the same pipe fittings that I used in this build but they don't offer custom cut pipe that you can order through the website. 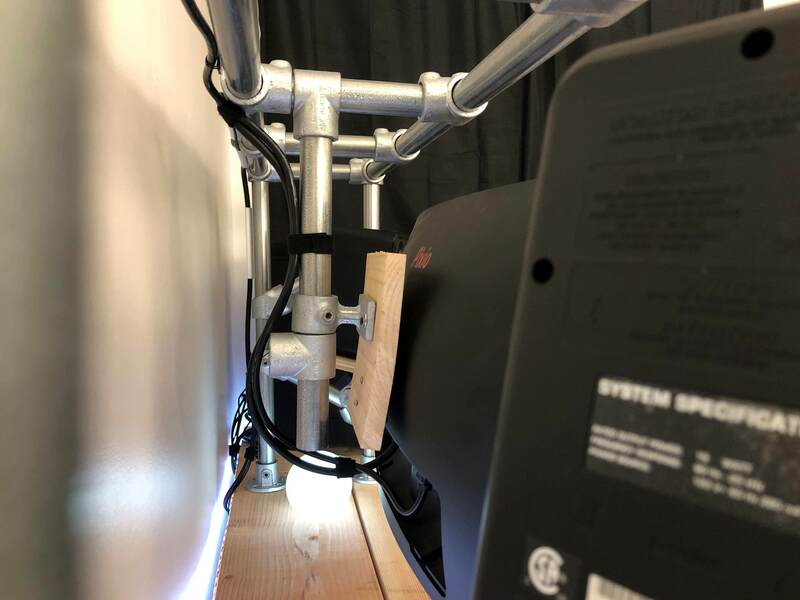 Before we jump into the final product, I wanted to talk about the issues I went through trying to find a solution for mounting my monitor. I spent a good amount of time looking for ways to mount my monitor to the pipe frame, sadly my initial searches didn't return anything useful. So I went with a DIY solution, but that proved to be insecure and ultimately I decided I needed a more "professional" solution. 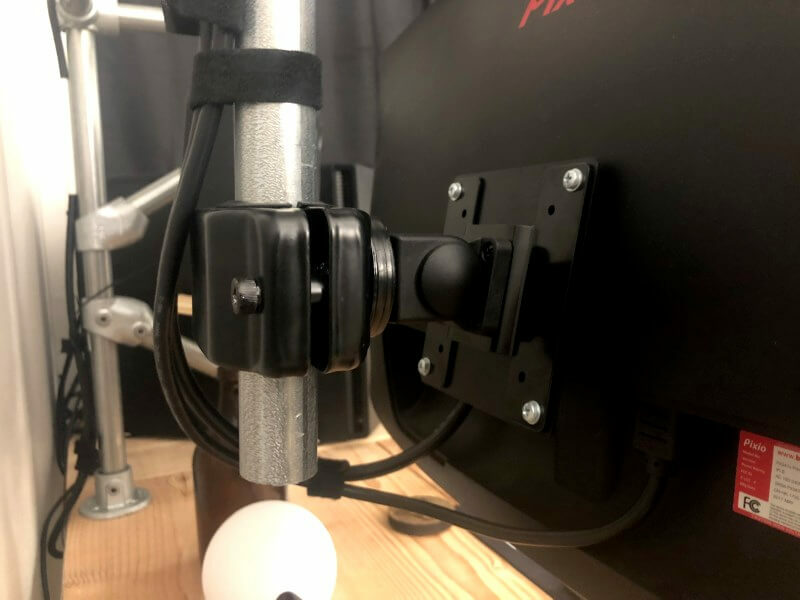 After getting discouraged and frustrated with my DIY monitor mount, I decided to broaden my search terms and after another hour or so of Googling various phrases that I thought would return what I was looking for, I finally stumbled upon a VESA pipe mount on Amazon. 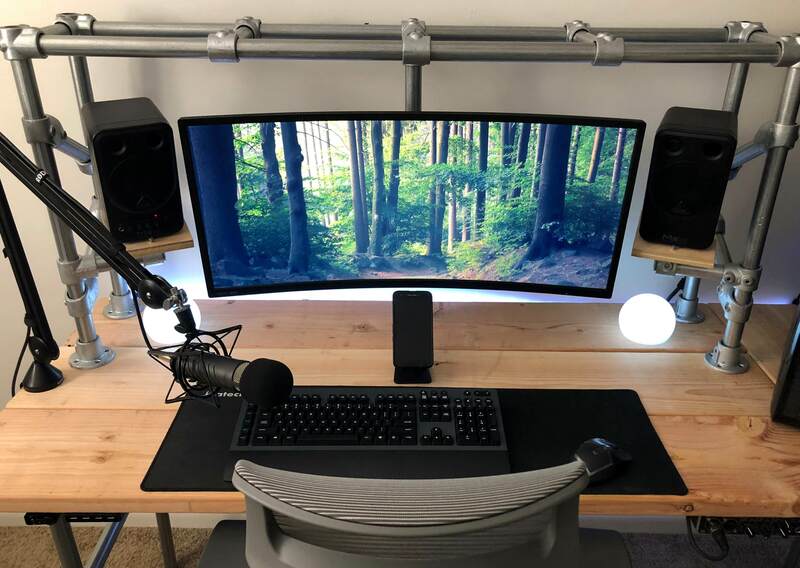 This thing is built like a tank and easily holds my ultrawide monitor in place, which isn't as easy as you might think. Overall, I'm super stoked about the final product. 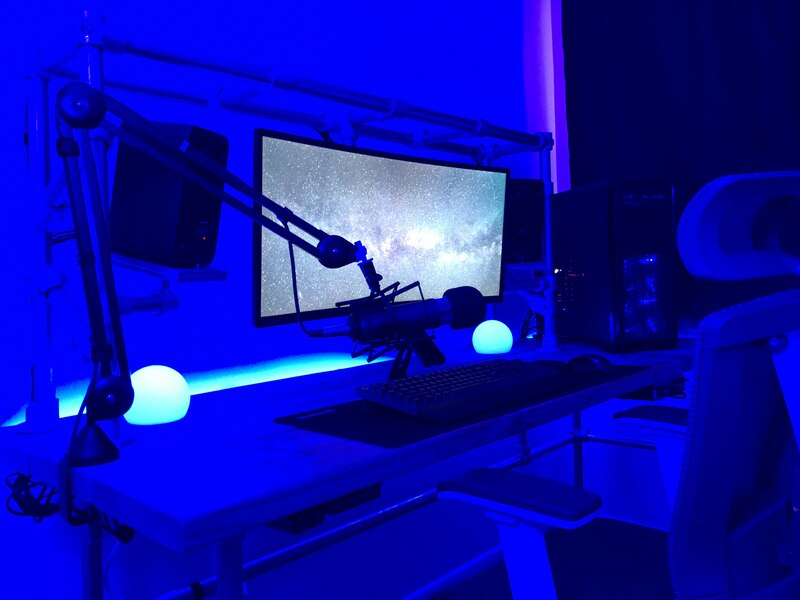 I love working, streaming and gaming from my desk. It makes playing on my PC just that much more immersive, especially with a sick lighting setup. Assembly was a piece of cake thanks to my detailed SketchUp file.